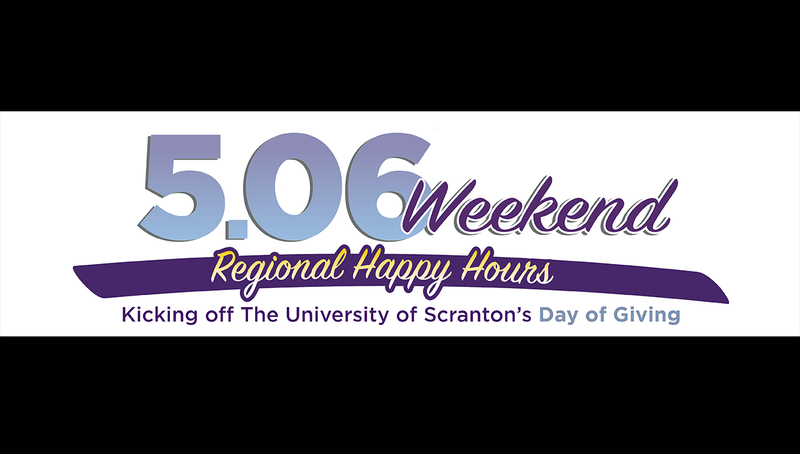 The University of Scranton will hold regional happy hours to celebrate 5.06 Weekend in Philadelphia, New Jersey, New York, and Scranton. This year marks five years of 5.06, the University's annual Day of Giving celebration. The happy hours, which will all take place Friday, May 3, will serve as kick-off events for the weekend's festivities. Royals in Philadelphia will gather together at 6 p.m. at the Field House, 1150 Filbert Street, Philadelphia,19107; visit this link to register for the event. Royals in New Jersey will gather together at 6 p.m. at Kilkenny House Restaurant & Pub, 112 South Avenue East, Cranford, NJ; visit this link to register for the event. Royals in New York will gather together at 6:30 p.m. at Printers Alley, 215 W 40th Street, New York, NY; visit this link to register for the event. Royals in NEPA will gather at Backyard Ale House at 6 p.m., 523 Linden Street; registration will open soon. The University will also hold several other 5.06 Weekend events, including a 5.06K family run/walk Saturday, May 4, at the Heritage Trail next to the Kevin P. Quinn, S.J., Athletics Campus, and a Virtual 5.06k for Royals who are unable to make the campus event but would still like to participate. Participation in either race counts as a 5.06 gift. Visit this link to register for the 5.06K and visit this link to register for the Virtual 5.06k. For more information on 5.06 Weekend, visit this link.